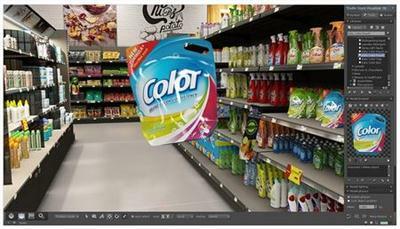 The Studio Store Visualizer Advanced (developed by VTales graphics) allows you to view and interact with packaging in a virtual retail environment. See your new designs on the shelf next to the competition, present a complete product launch in 3D, including retail-ready packaging, displays and other branded items. Test the visual impact of your latest design in the environment where it all happens: the store. Stereoscopic rendering makes it possible to view your virtual store on a 3D screen or in real immersive virtual reality with Oculus Rift and HTC Vive goggles. It's great for live demonstrations. Using Studio Store Visualizer's powerful Dynamic Lights you can add even more realism and life to your gorgeous virtual environments. Combine this with Studio Store Visualizer movie timeline and animation to create professional realistic movies to share with your clients. - Mac with Intel Processor. The Mac should have at least 2 cores. Recommended 4 cores. - Minimum 8 GB RAM, recommended 16 GB RAM. - 15 GB free hard disk space. - Minimum: Graphics card with 1 GB VRAM. 3GB or more are needed with large and complex environments. Recommended: 6GB or more. - 10.10 (Yosemite), 10.11 (El Capitan), 10.12 (Sierra).